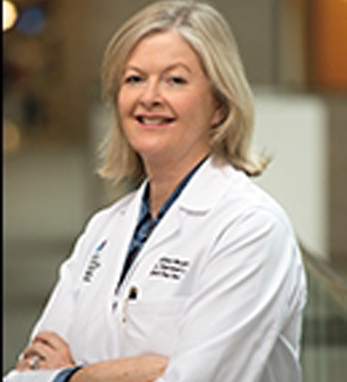 Barbara Murphy, M.D., is the Irene and Arthur M. Fishberg Professor of Medicine and Chief of the Division of Nephrology at Mount Sinai Hospital in New York. Her area of interest is transplant immunology, focusing on genomics in determining outcomes in transplantation and the Immunomodulatory role of MHC-derived peptides. Born in Ireland, Dr. Murphy earned her M.B. B.A.O. B.Ch. from The Royal College of Surgeons in Ireland and went on to do an internship at Beaumont Hospital in Dublin. She completed a residency rotation at Beaumont Hospital followed by a fellowship in Clinical Nephrology also at Beaumont Hospital. Dr. Murphy completed her postdoctoral training with a fellowship in Nephrology at Brigham and Women’s Hospital, Harvard Medical School. As part of this she trained in transplant immunology at the Laboratory of Immunogenetics and Transplantation, Renal Division, Brigham and Women’s Hospital, Harvard Medical School. Among her many honors, Dr. Murphy was awarded the Young Investigator Award in Basic Science by the American Society of Transplantation in 2003. In 2005, Dr. Murphy was named the Irene and Dr. Arthur M. Fishberg Professor of Medicine at Mount Sinai Hospital. Then, in 2011, she was named Nephrologist of the Year by the American Kidney Fund. Dr. Murphy belongs to a number of professional societies including the American Society of Transplantation and the American Society of Nephrology. Among her numerous achievements she has had many leadership roles at a national level, including being a member of the Board of the American Society of Transplantation, the Executive Committee of the American Transplant Congress, and Chair of Education Committee of the American Society of Transplantation. Most recently, Dr. Murphy served as the president of the American Society of Transplantation and is currently the Co-Chair of the American Society of Transplantation Public Policy. In these positions, Dr. Murphy aims to directly impact patient care and access to healthcare, specifically, advocating for long-term coverage for immunosuppression. Dr. Murphy’s research has focused on two major areas. Having demonstrated that MHC class II peptides derived from non-polymorphic regions may inhibit the alloimmune response in vitro and in vivo, Dr. Murphy is currently investigating their mechanisms of action and their ability to prolong allograft survival in vivo. Dr. Murphy is also the PI of a large multicenter NIH study investigating the role of genomics to predict the development of chronic allograft nephropathy. She was a co-investigator on the recent landmark study investigating outcomes in HIV-positive patients that receive solid organ transplants.